The control valve plays an important role in the loop adjustments, in the automatic control of industrial processes. Performs the function of varying the flow of control fluid, which modifies the value of the measured variable, behaving like a continuously variable area orifice. Within the control loop is as important as the primary element, the transmitter and controller. The shutter control performs the function of fluid flow, acting in the direction of its axis. In a shutter with equal percentage characteristic, every increment of stroke in the shutter produce a change in the flow that is proportional to the one that flowed before the change. • When the system dynamics are not well known. 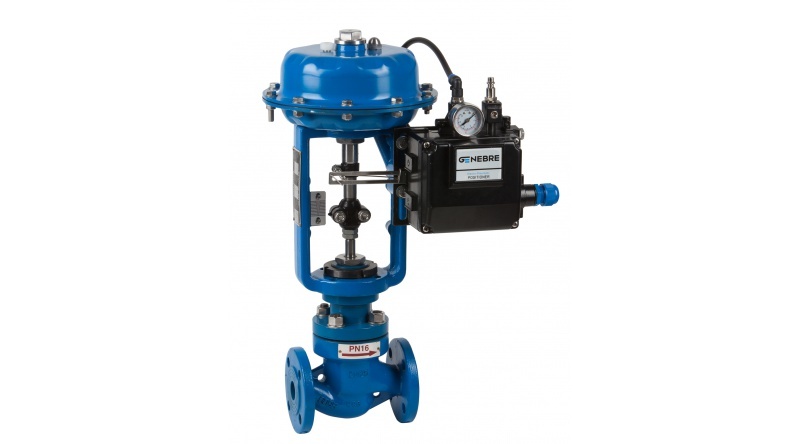 • When high range flow control is needed(rangeability) * * The "Rangeability" or field of flow control that valve is capable to regulate maintaining the inherent characteristic curve. Globe Valve: Valve whose construction is distinguished by controlling the flow through a linear movement. Valve with single seat and 2 ways. Single seat valves require a larger actuator for closing the shutter against the differential pressure of the process. The tight closure is achieved with stainless steel shutter and PPL seat. Connection: ASME B 16.5. ANSI Class 150. Features of Actuator: Diaphragm type. Maximum input pressure: 6 bar. Option: signal 4-20 mA with electro-pneumatic positioner. Genebre is a leading company and world reference in fluid control and high quality taps. We control all of the creation processes, responding to the specific needs of each market: from the inicial concept and design of the product to the production and commercialization.